Britain's Prince William and Prince Harry have been helping to move sandbags in flood-hit Berkshire today near Windsor Castle. 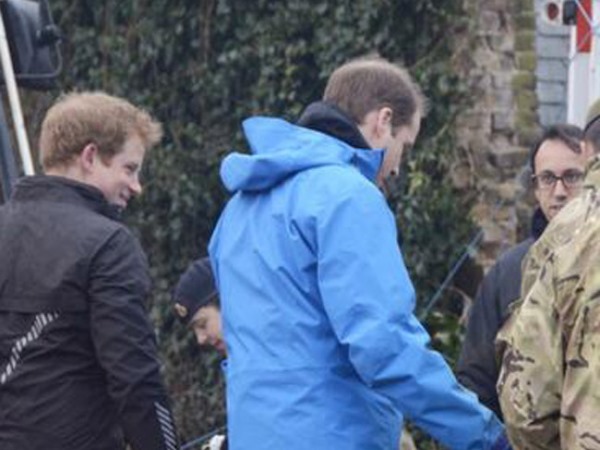 Britain's Prince William and Prince Harry have been helping to move sandbags in flood-hit Berkshire today. The royal brothers turned up at 7am at a golf club in Datchet, near to Windsor Castle, where they helped load sandbags onto a crane, according to witnesses. Sources say William (31) addressed journalists from the Guardian newspaper, who gathered near the site, and asked them: "Why don't you put notepads down and help?" The reporters agreed to lend a hand but aides intervened and said it would not be possible due to a lack of appropriate clothing. William and Harry (29) were filmed carrying the sandbags with 20 members of the Household Cavalry and Network rail staff. Dressed in waterproofs and Wellington boots, the royals helped move the heavy sandbags onto the back of an army truck. A Kensington Palace spokesman said of their actions: "They wanted to show their support for the flood victims and have joined the Armed Forces relief effort." The village has been severely affected by the ongoing floods and water rising in the River Thames and there have been fears the situation could get worse as more rain is expected. A royal aide also told the Guardian that the pair had been working with members of the Army unit this morning in a number of locations and that it was a "private effort" to help.